Let’s highlight the Genuine Temporary Entrant (GTE) requirements for the Australian Immigration for grant of a student visa Subclass 500. 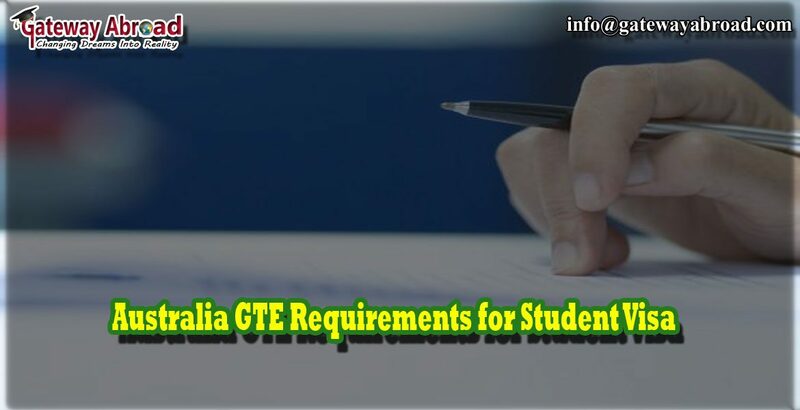 The GTE requirements are applicable to all students who aspire to study in Australia. Applicants must provide a personal statement of purpose in English addressing the GTE requirements. A special facility is there for those who are unable to write their SOPs in English. They can write down their statement of purpose in their own language or in any comfortable language; however, a translated copy of the statement must be attached with the form. The applicant must provide vital detail within the application forms or the written statements along with supporting documents. Applicants must be aware of the fact that general statements that are not supported by evidence or proper documents are not considered in the GTE assessment. Remember, the GTE requirements are not made on the basis of one factor alone. The personal circumstance of every applicant is considered individually before making the final decision. Circumstances in the residential country or home country: The applicant must point out the reasons for not studying in the home country or region if the similar courses are available there. Also, he or she must show some reasons that support the intention to return home country once the study is complete, economic conditions, military service commitments, political or civil turbulence in the home country. Potential circumstances in Australia: One must mention the strong points to remain in Australia during their higher education. The level of Australian education must be highlighted to make a difference between the Australian educational system and the education system of the applicant’s home country. The application should include the plan for living arrangements, student’s academic background, and financial stability. Significance of the chosen course to the applicant’s future: The applicant should make sure that the chosen course(s) is consistent with the applicant’s current level of education, relevant to past or proposed future employment in the home country, expected remuneration in the home country that would be earned by the applicant after end of the course. Immigration history of the applicant: The applicant must include previous visa applications for Australia or other countries, the visa refusals or cancellations if any. For the minor applicants, the intention of their parents or local guardian or spouse of the applicant must be informed. Previous study: The Academic detail that shows qualification(s) obtained, the name of the education providers(s) and duration of the study, certification of achievement. The gap of the previous study (in any) – with the reason of the break between the studies including where enrolment was not mentioned. Current employment: Name and address of the current company, period of employment, position detail, name and contact detail of the concerned person who can verify terms of employment. Information of the home country or the country of residence: This may include evidence of financial and family social detail. The applicant must show the interest to return after study. Economic circumstances in the home country or the country of residence: The applicant must include documents to show the employment or business activities of last 12 months prior to lodging the application, an employment offer course completion, and income tax return file or bank statement. Australian immigration encourages the applicants to give as much as information in their GTE statement as it can help to create a comprehensive view of their circumstances. They can make a firm decision on a study visa application with the information provided and there is no requirement to request more information.